The Ripley Wolves will play two make-up games this weekend in an effort to finish first in the North’s ‘A’ Division (fifth overall). They travel to Elora on Friday night at 8:30 p.m. and host Saugeen Shores on Sunday, Feb. 1, at 1:30 p.m. The Wolves are tied with the Shallow Lake Crushers for the top spot in the bottom half of the North, with a game in hand. If they finish ahead of the Crushers after this weekend’s games – Shallow Lake faces Lucknow in its only game – the Wolves will have home ice advantage through the ‘A’ playoffs, should they finish in the Top 4 of the six-team round-robin (the South Division will send Seaforth and Milverton to join Ripley, Shallow Lake, Shelburne and Lucknow). The Top 4 of the round-robin will then move onto the ‘A’ semi-finals. The Wolves have played three games recently, defeating Shelburne 6-1 and Shallow Lake 6-3, moving them into a tie for top-spot in the ‘A’, as well as an 8-0 loss to Durham. Goals in the Shelburne game went to Travis VanGaver, Mark Stanley (3), David Jones and Devin Kemp. Assists went to Jeremy McQuillin (2), Nick Locking, Tyler McCarthy, Drew Davidson, Cody Britton, Paul Stewart and Kemp. Kurt Edwards got the win in net. Jason Reid was in net for the Wolves big win over Shallow Lake on Saturday night. Locking had two goals, while Brett Catto, VanGaver, Britton and McQuillin had singles. Assists went to Jordan Turcotte, Corey McCrae, Locking, McCarthy, VanGaver and Brian Stanley. 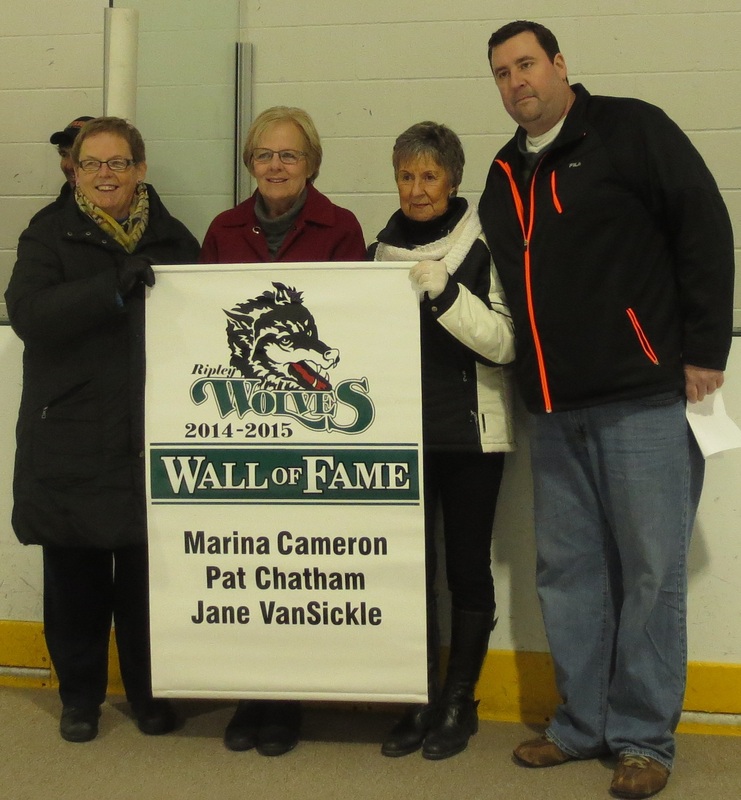 Also on Saturday, the Wolves inducted Marina Cameron, Pat Chatham and Jane VanSickle onto our Wall of Fame in a pre-game ceremony on Sponsor Appreciation Night. These three volunteers have been integral to the team’s success and are very deserving of the honour. Pat Chatham, left, Jane VanSickle and Marina Cameron and inducted onto the Wolves Wall of Fame by Kevin Taylor, the President of the Wolves executive.